I am getting old. This was confirmed by two things recently. First, I need reading glasses. I've noticed for a few months that small things are slightly easier to read without my glasses than with. I've worn specs since I was 8 years old, but this is the first time I'd noticed the close vision going. 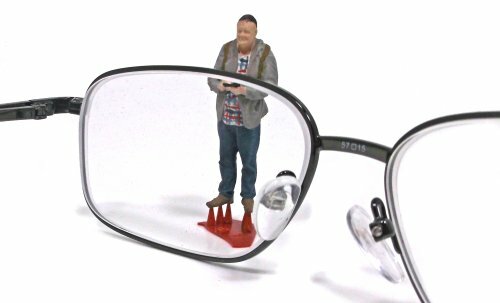 Apparently presbyopia — meaning "ageing eye" describes the loss in elasticity of the lens of the eye that results in the inability to read small print and focus on objects up close. It's perfectly natural and can occur from 35 years old onwards. Having managed more than a decade beyond this, I suppose I ought to be glad to have lasted so long. It's still a bit of a shock though, not least because that's another pair to buy. Close-up work is kind of important to me. I supposed I could just take my glasses off, but I like the protection offered by a plastic lens. Having once whacked myself in the face with some pliers while retrimming a car seat hard enough to gouge the lens, I am acutely aware how vulnerable these important organs are. Yes I know you can get something from Poundland, but Boots were doing a deal and I feel a bit more confident letting a professional assess something as important as my eyesight. Which brings me on to the other sign of ageing. My optician appeared to be 12 years old. It's not just policemen getting younger! Your not the only one. I started wearing reading glasses Two years ago having never worn glasses before. Two years later I am now on varifocals. I am informed from a friend of mine, that is Two years older than me that things don't get better, hmmm. Firstly, I noticed that my arms were getting to short to read things. I bought a cheap pair of glasses from Asda and spent the next couple of days suffering from really red and sore eyes, wasn't a good plan.